Giuliani brags about connections to reactionary FBI agents. 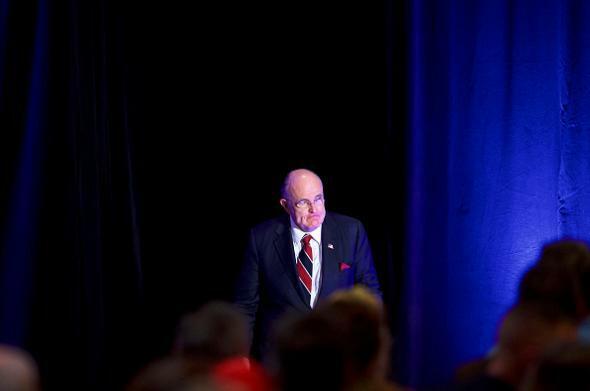 Rudy Giuliani in Gettysburg, Pennsylvania, on Oct. 22. Does leaking unflattering information about Hillary Clinton to one of Donald Trump’s top advisers count as working in concert with a campaign and/or advancing a partisan activity? It would seem that Rudy Giuliani understands that that might be the case, because when he went on Fox on Friday he denied that he’s in touch with current agents. “I’m real careful not to talk to any on-duty, active FBI agents,” he claimed, despite having attested at least twice in recent months to having done so. With this and Chris Christie’s top aides being convicted of public corruption felonies, I’m beginning to think Donald Trump might not be as committed to the cause of good government as he says he is!